Kaplan-Meier curves show survival rates for patients with (A) sarcopenia, with (B) low muscle radiodensity, and (C) in high, medium, or low tertiles of total adiposity. CT indicates computed tomography. SliceOmatic [computer program]. Version 5.0. Montreal, Quebec, Canada: TomoVision; 2015. Williams BA, Mandrekar JA, Mandrekar SJ, et al. Finding optimal cutpoints for continuous covariates with binary and time-to-event outcomes. Rochester, MN: Mayo Foundation; 2006. World Health Organization. Global Database on Body Mass Index. 2017. http://www.who.int/nutrition/databases/bmi/en/. Accessed February 5, 2018. Question Are sarcopenia, poor muscle quality, and excess adiposity at diagnosis associated with overall mortality in patients with nonmetastatic breast cancer? Findings In this observational study of 3241 patients with breast cancer, more than one-third presented with sarcopenia at diagnosis, and those women had a significantly increased risk of death compared with patients without sarcopenia. Poor muscle quality was not associated with survival, and highest mortality was in patients with sarcopenia and high total adipose tissue. Meaning Measures of sarcopenia provide significant prognostic information in nonmetastatic breast cancer and will help to identify high-risk groups and guide interventions to optimize survival outcomes. 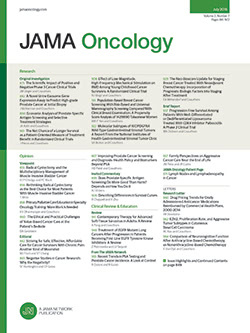 Importance Sarcopenia (low muscle mass), poor muscle quality (low muscle radiodensity), and excess adiposity derived from computed tomography (CT) has been related to higher mortality in patients with metastatic breast cancer, but the association with prognosis in patients with nonmetastatic breast cancer is unknown. Objective To evaluate associations of all 3 body composition measures, derived from clinically acquired CT at diagnosis, with overall mortality in nonmetastatic breast cancer. Design, Setting, and Participants This observational study included 3241 women from Kaiser Permanente of Northern California and Dana Farber Cancer Institute diagnosed from January 2000 to December 2013 with stages II or III breast cancer. We calculated hazard ratios (HRs) to evaluate the associations of all-cause mortality with sarcopenia, low muscle radiodensity, and total adipose tissue (TAT). Models were adjusted for sociodemographics, tumor characteristics, treatment, body mass index (BMI; calculated as weight in kilograms divided by height in meters squared), and other body composition measures. We also evaluated the cross-classification of categories of sarcopenia (yes/no) and tertiles of TAT, with outcomes. Main Outcomes and Measures Overall survival time and all-cause mortality. Results Median (range) age of 3241 women included in this study was 54 (18-80) years, and median follow-up was 6.0 years; 1086 patients (34%) presented with sarcopenia, and 1199 patients (37%) had low muscle radiodensity. Among patients with nonmetastatic breast cancer, those with sarcopenia showed higher overall mortality (HR, 1.41; 95% CI, 1.18-1.69) compared with those without sarcopenia. Patients in the highest tertile of TAT also showed higher overall mortality (HR, 1.35; 95% CI, 1.08-1.69) compared with those in the lowest tertile. Low radiodensity was not associated with survival. In analyses of sarcopenia and TAT, highest mortality was seen in patients with sarcopenia and high TAT (HR, 1.89; 95% CI, 1.30-2.73); BMI alone was not significantly related to overall mortality and did not appropriately identify patients at risk of death owing to their body composition. Conclusions and Relevance Sarcopenia is underrecognized in nonmetastatic breast cancer and occurs in over one-third of newly diagnosed patients. Measures of both sarcopenia and adiposity from clinically acquired CT scans in nonmetastatic patients provide significant prognostic information that outperform BMI and will help to guide interventions to optimize survival outcomes. The importance of body size on cancer outcomes is of great clinical interest.1 Measures of body composition that can distinguish adipose tissue distribution, as well as the quantity and quality of muscle, can help refine our understanding of body size to cancer survival. Previously, DEXA (dual-energy radiograph absorptiometry) scanning was the main tool to assess body composition. In recent years, software has been developed to use clinically acquired computed tomography (CT) images to estimate body composition. This advancement allows body composition assessment in large populations and facilitates measurement as part of routine clinical care. Body mass index (BMI; calculated as weight in kilograms divided by height in meters squared) is the most common measure of body size, and the relationship between obesity and breast cancer survival has been widely studied.2-4 Data derived from clinical trials, pooling projects, and meta-analyses have consistently shown that class 2 or 3 obesity (BMI, >35) was associated with worse survival,2 but studies have shown mixed associations with overweight2,4 or lower levels of obesity.2 One reason may be that BMI scales weight to height without distinguishing between muscle and adipose tissue, components of weight with differing associations with survival. Furthermore, low BMI can mask excess adiposity while high BMI can mask low muscularity. Few studies, mainly conducted in women with breast cancer with small sample sizes, have examined measures of body composition in women with breast cancer.5-10 Most found sarcopenia (low skeletal muscle mass) increased risk of death. One study8 found low muscle radiodensity (a measure of muscle quality indicative of adipose tissue deposition into muscle fibers and reduced function) increased risk of death. That we know of, our study is the first large-scale investigation to use clinically acquired CT scans to investigate measures of body composition in patients with nonmetastatic breast cancer. Our goal was to examine associations between measures of body composition, including sarcopenia, adiposity, and muscle radiodensity and overall mortality. This retrospective cohort study included clinically collected medical record data from all female patients aged 18 to 80 years diagnosed at Kaiser Permanente Northern California (KPNC) between January 2005 and December 2013, as well as at Dana Farber Cancer Institute (DFCI) between January 2000 and December 2012, with stage II or III invasive breast cancer who also underwent an abdominal or pelvic CT scan (includes positron emission tomography–CT scans) at the time of diagnosis (n = 3706). Because CT scans are not routinely performed for patients with stage I breast cancer, the study was limited to women with stage II (n = 6724) and III (n = 1768) breast cancer, among whom 29% and 73% received CT scans, respectively. Additional exclusions were lack of a valid weight at time of CT scan (n = 303); BMI less than 18.5 at the time of CT scan (n = 42); and unavailable and/or unreadable scans (n = 120). This left 3241 patients for analysis. The study was approved by the KPNC and DFCI institutional review boards, and informed consent was not required because patient information was taken from medical records. Deaths of patients diagnosed at KPNC were collected from mortality files that combine internal data, California state death data, and Social Security Administration data. Deaths of patients diagnosed at DFCI were collected from the electronic medical record and the National Death Index. Muscle area, muscle radiodensity, and adiposity were measured from CT scans within 6 months of diagnosis and before chemotherapy or radiation (median [range], 1.2 [−5.9 to 5.9] months after diagnosis). Two centrally trained researchers (T.A.O.) quantified the cross-sectional area of muscle and adipose tissue in centimeters squared at the third lumbar vertebra (L3), discriminating components by tissue-specific Hounsfield units (HU) ranges using SliceOmatic Software version 5.0 (TomoVision).11 Single-slice abdominal cross-sectional areas at the L3 vertebra are strongly correlated with whole body volumes of muscle and adipose tissue and have been used in many prior studies.12 The skeletal muscle index (SMI) was defined as muscle area at L3 in cm2 divided by height in meters squared. Skeletal muscle radiodensity (SMD) represents muscle quality and was measured using the average radiation attenuation of tissue in Hounsfield Units. Visceral (intra-abdominal) adipose tissue (VAT); subcutaneous adipose tissue (SAT); and intramuscular adipose tissue (IMAT) were all quantified separately. Total adiposity (TAT) was the sum of VAT, SAT, and IMAT. To assess interrater reliability, 30 images were randomly selected to be analyzed by both readers. The coefficients of variation (CV%) were 0.66 for muscle and 1.59 for TAT. We treated muscle and TAT area, as well as SMI and SMD, continuously, per standard deviation, as well as categorically. To derive the cut points for sarcopenia and low muscle density, we used optimal stratification,13 a widely used approach14,15 that selects a cut point for a continuous covariate by computing the log-rank statistic testing the between-group difference in overall survival. We used the SMI cut point that had the maximum absolute value of the log-rank statistic16 for establishing the presence of sarcopenia (<40 SMI) and low SMD (<37.8 HU). Follow-up began at the CT scan date and continued until death, last contact, or July 31, 2016, for the KPNC cohort or October 30, 2016, for DFCI. Time to failure by categories of sarcopenia (yes/no), SMD (yes/no), and TAT (tertiles) was evaluated using Kaplan-Meier survival curves and log-rank tests. Multivariable-adjusted hazard ratios (HRs) and corresponding 95% CIs for risk of mortality associated with sarcopenia, SMD, TAT, and BMI both continuously per standard deviation, as well as categorically, were estimated using Cox proportional hazards models. Covariates were chosen a priori based on previous research. We first adjusted for age at diagnosis, and then for covariates including race/ethnicity, stage, grade, smoking, surgery type, receipt of chemotherapy, and estrogen receptor (ER) and/or HER2 receptor status. Models were then simultaneously adjusted for muscle, TAT, and partitioned BMI (defined as BMI with weight from muscle and adipose tissue removed). We also assessed effect modification of the associations between body composition measures and survival by the following covariates: age at diagnosis (<55 and ≥55 years); BMI category (18.5 to <25, 25 to <30, and ≥30); cancer stage (II/III); and ER status (negative/positive); P values for the corresponding Wald tests of the interaction terms are reported. We tested for multiplicative interactions between TAT and sarcopenia on survival using cross-product terms. We also examined additive effects by categorizing patients into 6 mutually exclusive categories based on sarcopenia and TAT status and assessed joint associations with sarcopenia and adiposity with time to event to evaluate associations with specific phenotypes. Normal weight (BMI 18.5-25) and lowest tertile of TAT served as the reference phenotype. All statistical analyses were performed using SAS version 9.3 (SAS Institute Inc). Statistical significance was established with 2-sided tests with α = .05. Median follow-up time was 6.0 years during which there were 619 deaths among 3241 patients. As shown in eTable 1 in the Supplement, at diagnosis of their primary breast cancer, 1086 patients (34%) had sarcopenia and 1193 (37%) had low muscle radiodensity. Those with sarcopenia and low SMD (ie, muscle quality) were older (57.0 vs 52.7 and 60.6 vs 50.3 years, respectively) and less likely to receive chemotherapy. Women with sarcopenia (n = 1086) vs without sarcopenia (n = 2155) were more frequently white (74.4% vs 67.8%) and Asian (15.3% vs 11.2%) and less frequently black (3.1% vs 9.3%) and Hispanic (5.3% vs 10.5%) (eTable 1 in the Supplement). In contrast, women who were low SMD (n = 1193) versus normal (n = 2048) were more frequently white (76.4% vs 66.8%) and less frequently Asian (7.1% vs 15.8%). Body mass index was differentially associated with body composition measures: sarcopenia was associated with a lower mean BMI (24.7 vs 30.0) than those without sarcopenia, while low SMD was associated with a higher mean BMI (31.1 vs 26.6) than those with low SMD (eTable 1 in the Supplement). eTable 2 in the Supplement presents distributions of body composition measures by sarcopenia and low SMD cut points. Kaplan-Meier curves demonstrate that patients with sarcopenia (Figure, A), low SMD (Figure, B), and medium or high total adiposity (Figure, C) had worse overall survival than those without sarcopenia (log-rank P < .001), low SMD (log-rank P < .001), or low adiposity (log-rank P < .001). In multivariable Cox proportional hazards models (Table 1), sarcopenia was associated with a 41% (HR, 1.41; 95% CI, 1.18-1.69) greater risk of dying compared with those without sarcopenia. Similarly, an increase in 1 standard deviation of SMI (7.2) or absolute muscle area (19.9 cm2) was associated with a 13% and 10% decreased risk of death. In contrast, skeletal muscle density was not significantly associated with overall survival. The association of sarcopenia or low SMD with survival was similar across strata defined by age, BMI, cancer stage, or ER status (eTable 2 in the Supplement). To examine the robustness of our results, we also conducted a sensitivity analysis using previously published cut points to examine effects of both sarcopenia and low radiodensity14 on survival. Estimates for survival were similar to those reported using our own cut points (HR, 1.24; 95% CI, 1.03-1.51 for sarcopenia [yes/no]) and low SMD (HR, 0.95; 95% CI, 0.79-1.15 [yes/no]). We also conducted a sensitivity analyses removing patients who died less than 1 year from breast cancer diagnosis. Again, results were similar to when those patients were included (HR, 1.37; 95% CI, 1.14-1.65 for sarcopenia [yes/no]), and low SMD (HR, 0.95; 95% CI, 0.78-1.17 [yes/no]). Compared with the nonsignificant associations of BMI with mortality after multivariable adjustment, results for total adiposity and the combined effects of adiposity and sarcopenia with survival (Table 2) were stronger and statistically significant. Compared with patients with normal weight (BMI 18.5 to <25), patients who were overweight (BMI 25 to <30) had a similar risk of death; patients who were obese (BMI ≥30) had an elevated risk of death, but this was not statistically significant. In contrast, those in the highest tertile of adiposity had a significantly greater risk of death (HR, 1.35; 95% CI, 1.08-1.69) compared with those in the lowest. The association of adiposity with mortality did not vary significantly by age, BMI, cancer stage, or ER status (eTable 2 in the Supplement). We then cross-classified adiposity and sarcopenia to understand the differential effects of each. Among those without sarcopenia, only those in the high tertile of TAT had a significant increased risk of death (HR, 1.40; 95% CI, 1.04-1.88) compared with those with low TAT and without sarcopenia. However, among those with sarcopenia, there was an increased risk of death, regardless of level of total adiposity compared with the reference group (no sarcopenia, low TAT). We found no evidence of a statistical multiplicative interaction. Thus, the increased risk for those with sarcopenia with higher TAT can be attributed to an additive effect of the 2 risk factors. Among patients who were overweight (BMI, 25-30), the majority (n = 673 [66%]) fell into the middle tertile of TAT. Only 189 patients (18%) were in the high tertile of TAT, and 160 (16%) fell into the low tertile of TAT. Among patients with class 1 obesity (BMI 30-35), the majority (n = 440 [73%]) fell into the high tertile of TAT, but 162 (27%) still fell into the middle or low TAT tertile. It is not until women reach class 2 obesity or greater (BMI >35) that almost all the women were classified into the high tertile of TAT. To our knowledge, this is the largest study to date of patients with nonmetastatic breast cancer, and we demonstrate that sarcopenia is underrecognized, highly prevalent, and is associated with a significant increased risk of death. We also establish that muscle and fat mass assessed from clinically acquired CT scans are more strongly associated with survival than BMI, suggesting these would be more useful in identifying women at risk of poor survival due to adiposity. Furthermore, we also show that sarcopenia (eg, muscle mass) and adiposity (fat mass) are both important risk factors and should be considered together when assessing risk. These prognostic measures can be easily integrated into routine clinical care using new software to generate highly accurate measures of body composition from clinically collected CT scans. This is the first large-scale study that we know of to establish sarcopenia cut points derived from a population-based sample that can be applied to other patients newly diagnosed with nonmetastatic breast cancer. Furthermore, our findings were robust using cut points derived from other populations. Only 5 previous studies have been published on the association between muscle and survival in patients with breast cancer,5,7-10 3 in patients with metastatic disease,7-9 and 2 in patients with nonmetastatic disease.5,10 All but 1 study demonstrated an increased risk of death associated with low muscle area or sarcopenia.9 The largest to date (n = 471) in patients with nonmetastatic breast cancer (stage I-IIIA)10 showed that sarcopenia measured by DEXA was associated with overall mortality (HR, 2.86; 95% CI, 1.67-4.89) but had only a small number of events (n = 92) and the muscle measurement was taken after chemotherapy treatment. In contrast, among patients with metastatic disease, Rier et al8 (n = 166), showed that low muscle radiodensity (HR, 1.72; 95% CI, 1.14-2.62), but not sarcopenia, was associated with a significant increased risk of overall mortality. Our study, with many events, enabled us to demonstrate effects of muscle were consistent across age, BMI, and cancer stage. Our results and others demonstrate that muscle characteristics are important predictors of survival in both nonmetastatic and metastatic breast cancer. Although our study of patients with nonmetastatic disease did not find a relationship of survival with SMD (a surrogate of muscle quality), 1 previous study of metastatic patients did report a relationship.8 However, in their study, the mean radiodensity (33.4 HU) was much lower, indicating more fatty infiltration than in the patients with nonmetastatic disease in our study (40.6 HU), and prevalence of low radiodensity (59.6%) was much higher in patients in the previous study than in our study (37%). This suggests that fatty infiltration into muscle could be a hallmark of more advanced cancer but is not as prevalent in earlier stage disease, so consequently a less important prognostic indicator for patients with nonmetastatic disease. Our findings on adiposity are consistent with the 2 other studies of patients with nonmetastatic breast cancer5,6 examining measures of adiposity with survival. Both found that among patients with locally advanced breast cancer, high visceral adiposity decreased distant disease-free survival (DDFS)6 and increased death5. Our results from the cross-classification of BMI with total adiposity suggest why prior studies on BMI and survival yielded inconsistent results. When a direct measure of adiposity is used, only those in the highest tertile of TAT are at increased mortality risk; yet, when classified by BMI, only 18% of women who are overweight (BMI 25-30) and 73% of women who are class 1 obese (BMI 30-35) women fall into the highest adiposity category. Misclassification in the overweight and class 1 obese categories could explain why prior studies did not always find significant associations between BMI and survival for women with BMI less than 35. Several limitations must be noted. First, as in all observational studies, causal relationships cannot be determined, and unmeasured confounding is possible. However, we tried to minimize this with our use of a well-characterized data set with data on patient and tumor characteristics and treatment. Second, reverse causality (sarcopenia as a consequence of cancer progression rather than a cause) may explain some of our observed associations. However, results were similar when we excluded patients with breast cancer who died within the first year or with BMI less than 18.5 at diagnosis, which mitigates, though does not eliminate, the influence of reverse causality. In addition, we demonstrated consistent associations of sarcopenia with survival across stage at diagnosis, all of the above making reverse causality a less likely explanation. Third, selection bias may affect the generalizability of the results because only 29% of women with stage II disease received CT scans. Women with stage II disease with CT scans were slightly younger, more likely to have higher-grade and ER-negative tumors, and thus more likely to receive chemotherapy. Thus, it is possible that the relationship of body composition to survival in this subset of women is not generalizable to all women with stage II disease. Lastly, while we use a data-driven approach to define sarcopenia at a single time point based on survival outcomes, this approach has been widely used in many studies with remarkably similar cut points for sarcopenia across various populations. Additionally, in a sensitivity analysis using previously published cut points, we observed similar estimates for the effects of sarcopenia and low radiodensity on survival. We demonstrate that sarcopenia is not a condition restricted to patients with later-stage disease but rather is highly prevalent among patients with nonmetastatic disease across all levels of BMI. Our findings are likely generalizable across many other nonmetastatic cancers because the associations with muscle and improved survival for those with metastatic cancer has been observed across a variety of solid tumors. Additionally, information on muscle quantity and adiposity from clinically acquired CT scans provide significant prognostic information that outperforms BMI.21 Both muscle and adiposity represent modifiable risk factors in patients with breast cancer. In addition to weight loss, we should also consider interventions to improve muscle mass, such as resistance training or protein supplementation.22 In the era of precision medicine, the direct measurement of muscle and adiposity will help to guide treatment plans and interventions to optimize survival outcomes. Corresponding Author: Bette J. Caan, DrPH, Kaiser Permanente, Division of Research, 2000 Broadway, Oakland, CA 94612 (bette.caan@kp.org). Accepted for Publication: January 3, 2018. Author Contributions: Dr Caan had full access to all of the data in the study and takes responsibility for the integrity of the data and the accuracy of the data analysis. Study concept and design: Caan, Cespedes Feliciano, Prado, Kroenke, Chen. Drafting of the manuscript: Caan, Chen. Statistical analysis: Caan, Cespedes Feliciano, Alexeeff, Bradshaw, Quesenberry, Weltzien. Obtained funding: Caan, Prado, Chen. Administrative, technical, or material support: Caan, Cespedes Feliciano, Prado, Castillo.